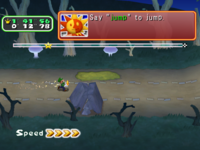 Dark Path is a normal difficulty spooky obstacle course in the Star Sprint mode of Mario Party 6. In this stage, there are fences and slimy puddles of unknown green sludge. The stage has a many Red Boos in the background. When the player reaches a foggy area, they will have to summon the other characters to blow away the fog. To do this, the play must say "wave" ten times. The path that follows contains a Metal Mushroom, which can easily get the player through the rest of the path. Then the player will reach a dark room and will need to summon the other characters to light it up. To do this, the player must say "spin" ten times. This lights a chandelier and gets rid of the Red Boos blocking the player's path. This page was last edited on February 4, 2019, at 22:39.